Jingle bells, jingle bells...I am in a Christmas mood! Christmas cookies are the simpliest but prettiest things to make. Also the most fun, in my opinion, as you get to mess about with dough, use cookie stampers and decorate with icing. These lemon biscuits and gingerbread cookies are a sweet decadent way to usher in the Christmas season. The lemon dough smells great by itself, flavoured by lemon zest and a brilliant lemon extract. They are then rolled into sheets and cut out into little shapes. I got to use the new cutters I bought, hearts, stockings, bones, as well as old shapes like stars, christmas trees and gingerbread men. This made me happy. I also got to pick and mix coloured icing. This makes me very happy. I piped shapes and then in-filled them with runnier coloured icing. This is a great project for kids, though I don't know how many would be able to be as precise about their decorations, maybe for kids, cupcakes would be the best way to go. More working surface area! The icing actually dried pretty quick, so it's important to be fast, but also, accurate on the first go. My piping skills could use some work, I'm out of practice! I think once you become more adept at judging the consistency of the icing than you can use finer and finer tips but really, it just takes the patience to wait and to pipe tiny decorations on the cookies. 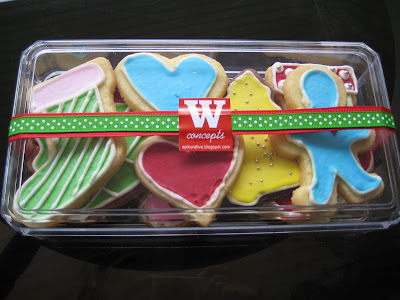 I packaged these cute little shapes into these lunch boxes and put some simple christmas ribbons around them. I really enjoyed the contemplative process of doing this, I just wish I had more time to do more. December is really that time of year, for lazy yet festive cheer, for holly and sugar cookies, snow and reindeer. 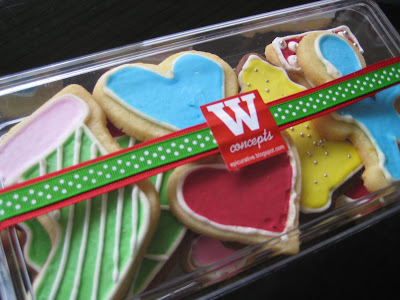 Although I really love the presentation of the cookies, I must say the best part about them is giving them away. Specifically, it's the perhaps selfish but oh-so-amazing feeling of watching their reactions of surprise and glee. I guess because they are decorated and a little more intricate then a cake or tray of lemon bars, for example, they are a bit more fun to examine. 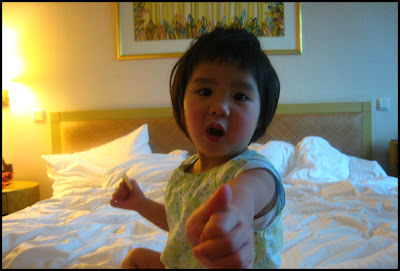 Umami sent me this picture and for all the 'process' photos here, this one was the image that made my day. Apparently the apple-cheeked princess was almost done with this cookie after I'd left. Thank you, dear See Wah for this! Made the whole process more than worth it! I always find pears stewed in red wine the easiest thing to make and the good thing is it's quite healthy as well. I prefer to stew brown skinned pears, rather than green-skinned pears though, the reason for that is that the brown skin pears tend to be sweeter, while the green-skinned ones are more sharp tasting (the offset is that brown-skin pears tend to be slightly grainer while green pears have a tighter grain texture). I like making these becuase the pears look so beautifully pristine when they come out of their wine bath and have air-dried into a smooth berry-maroon hue. That being said, I like using white wine, as it tends to be less tannic and sweeter, stewing only in red wine tends to impart a very bitter, residued taste to your pears. Before turning on the heat, I rub the honey onto the pears, then immerse them into the bath and splash red wine over them for colour. The sauce will turn red as well and slowly caramelize. Over the cooking process, I sprinkle caster sugar over the pears again- these were on the stove for an hour on simmer but you should just check them once in awhile and make sure they don't start to disintegrate, you want them soft but still supple and turgid. Beat the whipping cream till it forms soft peaks, then fold in the marscapone cheese and top with blackberries and raspberries. Serve the pears standing up, lift them from the pot by the stalks and chop the bottoms flat, if they don't stand naturally. 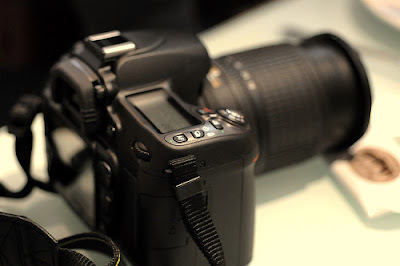 There are a few things I don't eat...this is a great subject for food bloggers. It's sort of the anti-Christ of Anthony Bourdain isn't it, what foods will you not eat for love or money? For me, that list runs to believe or not, mint (yes, it took me years to switch to Colgate from my beloved non-minty Orange Lion toothpaste), capsicum and ang ku kueh (a Chinese dessert with peanut stuffing in a bright red glutinous steamed dough cake). Actually, I am terrible with Chinese desserts in general, given my dislike for the texture of gooey paste. This is quite embarassing in Singapore, as the end of a Chinese banquet meal finds me ackwardly prodding the dessert round and round with a spoon, smiling brightly while pretending that its disappating. That category obviously includes or-nee (a yam paste), yellow/red/green/mung bean soup/paste/buns. I also don't like almond essence/jelly/soup (though I like the real thing and almond cake) and while I like strawberries as a fruit, I don't like the ice cream. I would put this down to a dislike for artificial flavouring but the reality is I'm a huge fan of those multi-coloured bubblegum Paddlepop ice creams! Mexican food, then, is probably my least favourite cuisine and Chili, which is a very American invention, was also something that, despite my years in the US, I avoided. After a recent trip back though, I started to think about Chili as served at a football game in the cold and somehow thought, well, perhaps it's not that bad and perhaps the recipe can be made to more Asian tastes. I had my reservations about the recipe I found online, not because of the shortage of reviews (there were about 500 reviews but all from alumni of a university recipe) but because some reviews said it tasted like it all came out of a can, so I made some changes, largely to make it less spicy (I took out the jalepeno peppers), quartered the quantity of beans and to make it taste fresher (I increased the amount of sausage and vegetables, took out the beef bouillon cubes, changed the dried herbs to fresh herbs, increased the amount of Worcestershire sauce and changed half the cheddar cheese to Parmesan Reggiano, amongst other things). (1) Heat a large stock pot over medium-high heat. (3) Crumble the ground chuck and sausage into the hot pan, and cook until evenly browned. Drain off excess grease. (4) Pour in the beans, tomatoes and tomato paste. Add chile peppers and beer. Season with chili powder, Worcestershire sauce, garlic, oregano, cumin, hot pepper sauce, basil, salt, pepper, cayenne, paprika, and sugar. (5) Stir to blend, then cover and simmer over low heat for at least 2 hours, stirring occasionally. (6) After 2 hours, taste, and adjust salt, pepper, and chili powder if necessary. The longer the chili simmers, the better it will taste. Remove from heat and serve, or refrigerate, and serve the next day. (7) Serve hot, ladled into bowls or pan toasted tortilla wraps, and top with shredded Cheddar and Parmesan Reggiano cheese. If given my own way, I would have changed the garnish to coriander (heavenly!) and served it with Thai rice crackers instead of tortilla wraps or nachos. Shopping for ingredients also proved quite a challenge. For example, what exactly are chili beans? For those who don't know, they are pinto, kidney, navy or great nothern beans, never white beans or black-eyed peas. In Singapore, we are a bit short for choice, we have exactly one brand of canned kidney beans, then basically an entire shelf of baked beans (calcium, salsa, cheese and ayam, which is chicken, varieties), a weird Greek giant bean and white beans (which for some reason, are shelved with Progressive soups and not in the canned beans section at all). If you are shopping in an expat supermarket, then you may also have a choice of Pinto beans, though if you are looking for beans that hold their shape better, I would suggest the harder kidney bean and not the more jelly-bean like pinto. In fact, there is a big debate about whether chili should have beans at all. There is this website called the Great Chili Project which states that "beans are the biggest controversy in chili cookery" and quotes a book on just the subject of With or Without Beans as concluding that "an assay of all material accumulated indicates a preference for with beans." That was in 1952. In 1981, when Bill Bridges wrote on chili, he cited Ray Shockley of Wolf Brand Chili as the source for the following statement: "In Texas, the preference for straight chili runs about three to one, while almost everywhere else in the country, chili with beans is preferred by the same majority." It turns out that pinto beans are the most popular in chili, if you add them at all (although I stand by kidney as much less mushy). There are some pretty good reasons for cooking "straight" chili. The most basic reason is that once beans are in the chili, they cannot be removed. Also the popular belief is that chili made with beans can't be reheated, since the beans get sour and turn to mush and truly chili must be reheated to reach its final patina of perfection. Other lesser reasons are the hemicullulose of the bean cell wall and the indigestability (read: flatulence) of the combination of the two non-absorbable carbohydrates of beer and bean. Note- bean chili Can be reheated, as I discovered this past weekend. In any case, I suspect chili is so popular in the US because it's super easy to make (basically its like a stew with beef chuck), can be stored for days and weeks if frozen and when served piping hot, it can be very comforting. I liked this version, it has a good hot kick in the finish from the tobasco, though you have to re-add some if you keep it overnight as it gets absorbed. The chili here is slightly watery and the reason is that after pan-heating the flour tortilla wraps, you want to put the chili on the pan, to let it sizzle, heat up and dry out which will also help the cheese melt onto the meat. The recipe is very versatile, in its runniest form, it can actually be served over pasta. For our family dinner, I used it as a coffeetable dip with guacamole and nachos and my cousins unanimously loved it and wanted to have it again. You can also make a healthier and incredibly yummy version by saute-ing fat-cut chunks of mushroom and thyme and mixing those in with a half proportion of chili for the tortilla wrap stuffing. This must be sort of the ridiculousness that a new parents feels. This is my new baby! Yay...I should have got it years ago, it has brilliant functions complex enough that I actually have to learn. 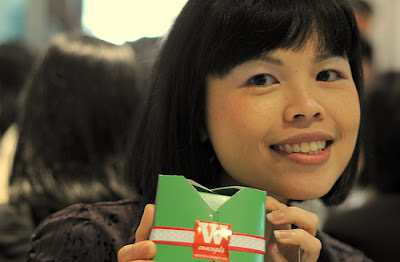 I had been looking forward to Friday the whole week, not because it was Friday, well, perhaps a bit because of that, but also because Mia had kindly arranged lunch for some of us bloggers with See Wah, also known as our Personalite de Paris from the blog Umami. 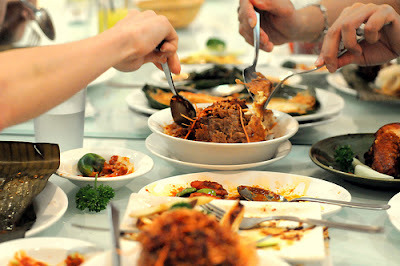 We had arranged to go to Pagi Sore, which is an Indonesian restaurant popular with the Raffles Place/Shenton Way bloggers. Karen, Sam, Ivan and Andrew also came to join in the pre-Christmas festivities. This restaurant serves up halal Indonesian delicacies and is a 23-years old family business, which was started by Liyana Kwan- I believe the original was and probably is still in Jurong. It was wonderful to see them all again and the conversation flowed as quickly as did our ordering. I think I over-ordered for us though becuase I somehow thought that the three people sitting at the edge of the table were unfamiliar bloggers. They aren't..it's just that this place has become so crowded and so popular that they make you share tables (and don't even try coming without a reservation at lunchtime, the food is good and those bankers have lots of cash to throw around especially at the end of the year). 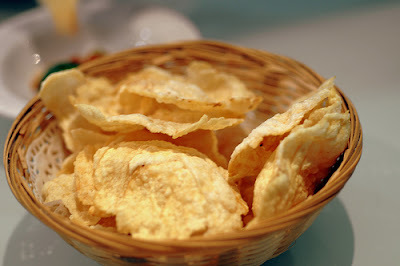 The service, as usual, was slow, we feasted for a long time on these keropok and sambal belachan (which they by the way, charge you for). That wasn't really a problem though for the bloggers are as talented and high-powered as they are beautiful. 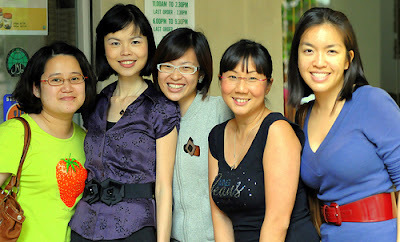 These are very strong, capable, successful women! 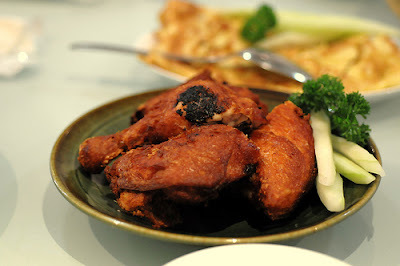 The first dish to arrive was the ayam bali (marinated grilled chicken), which you pay for by the piece. Two of these dishes were 4 pieces and the omelette. Ivan commented that the chicken was very good, which it was, crispy and tender, though a little oily. 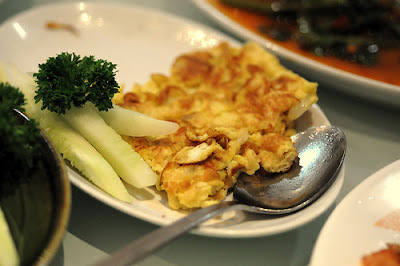 The omellete was also good, though pretty much a plain but well-cooked Malay one. They also brought us the sambal kangkong, udang pedas (sambal prawns with petai), ikan otah kukus (steamed fish with otah seasoning). 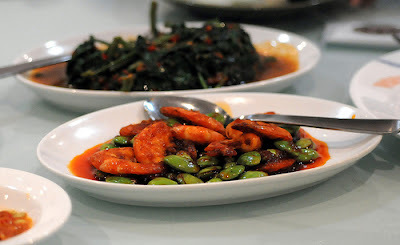 I liked the sambal kangkong, it had a good stingy taste, but I generally feel its a pretty generic dish and while well-fried enough, there wasn't much stem to the kangkong, so you didn't get that lovely hollow water-turgid crunch. The petai, I guess I'm biased and not a big fan but I didn't like it that much and it was quite drowned in chilli. The steamed fish on the other hand, I can never figure out how they make it taste so good! This is by far my favourite dish at Pagi Sore. I used to make something similar at university with chilean sea bass and a laksa sauce but it wasn't milky and smooth the way this one always is. Apart from tasting great, it is always consistent, which I truly appreciate. 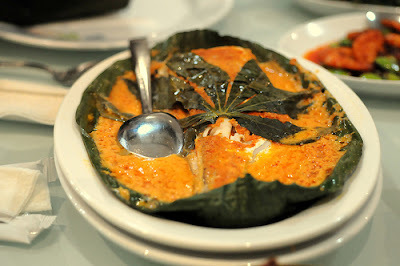 The otah part tastes very light and I think they mix egg in, so that as it steams the sauce-curd kind of sets around the fish. It's so super tasty ....and while they call it ikan, the fish is a smooth white fish but far too long-tailed to be pomfret. We tucked in happily to all this food, while being regaled by Ivan's tales of cooking Marmite pork ribs and financial advice from our in-house consultant! We're definitely looking forward to more meals and samples (hint, hint). The last dishes to come, probably the most complex or something, were the cumi bali (grilled squid with sweet sauce) and tahu telor (fried tofu with egg). 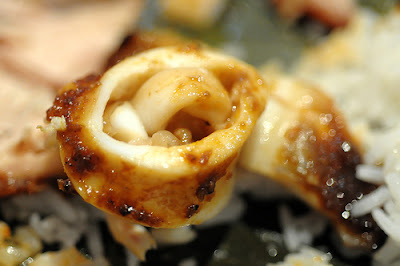 I know you guys are going to laugh at me but I've only recently learned how to eat squid. Not that I couldn't before, but growing up, there was something I didn't like about the turgid, almost wriggly feeling of squid rings, especially, in your mouth. They tasted like they were still alive, or could come alive. These squid however, were a revelation. Trailing tastes of spicy barbeque and sambal, as well as sweet black sauce and supple yet nuanced squid meat, this was definitely my new-found favourite at Pagi Sore! 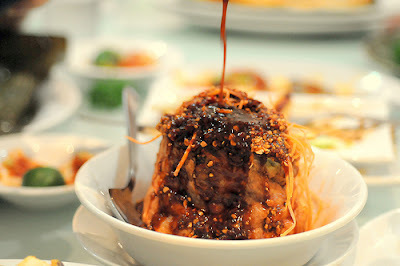 The Tahu Telor is my old favourite...yes, I do like the food here... and it's quite a production. They bring it steaming hot to your table and proceed to stream a trickle of black peanut-laden sauce over it. You can then tease it apart and serve it up with the grated carrot topping. 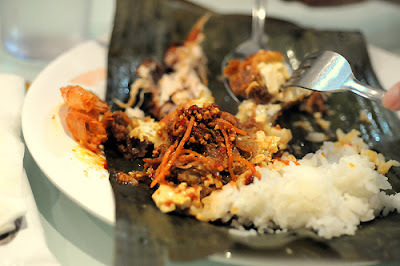 While I like the version of this dish at Rumang Minang Makan more (which is why this is not my absolute favourite but my near favourite!) theirs is also very yummy. Crusty on the outside, soft and almost sweet on the inside. 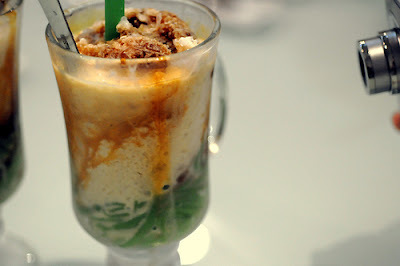 We ended the meal with some avacado shakes (with gula meleka) and some very satisfactory ice chendol. A great end to a great meal, at a cost of $30 a head (a Lot of food). Yay...December! This was the kind of meal and company that makes you happy and I made a mental note to make a reservation to bring my family here when Colin's back for his holidays. I digress. I wanted to make a mushroom pasta with the fresh, no, make that frozen, chanterelles that I had ordered online. I tried to look up non-cream based pasta recipes and discovered one by Emeril that used a tomato base, as well as one by Chubby Hubby (but I guess really Tetsuya) that was a beautiful Asian take on mushroom pasta. For some reason, I really wanted to braise the milk-fed veal shanks though. So I did, using this brilliant recipe below, which is one of the most vaulted recipes online and which can also be used for lamb shanks. My only change to the original recipe is I've added in a healthy tablespoon of tomato paste and an extra can of whole tomatoes (tomatoes only for the second can and always Italian tomatoes yeah). Add the remaining ingredients and simmer on low flame for 2.5 hours or till meat is tender or falling off the bone. If you wish, you can remove the shanks and reserve the juices till thickened. I simmered the mixture for 2 hours to get it to soft and yielding meat but still on the bone. I then let it go for another hour to get it still on the bone, but falling off gracefully when prodded. I then sauteed some mixed mushrooms with basil, mixed in the meat sauce and served it over fresh tagliatelle. It was quite gorgeous, especially served with a handsome bare veal bone. Even my parents, not your biggest Italian food fans, raved about the depth of the taste. My dad said it three times, which is a stretch for him, though admittedly once was to Colin while online. The only pity was Colin's not back yet from school to try it, but I saved 2 veal shanks for a dinner when he is. 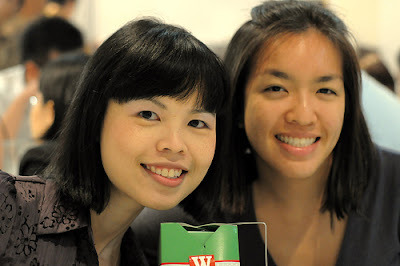 Before you accuse me of any bias, I am going to state upfront that I was given a number of vouchers to spend on the online grocery service, www.greengrocer.com.sg to test out their website. I wasn't obligated to write anything about it, outside of feedback to the organization. Here goes...When I lived in New York, Freshdirect had just started service in Manhatten. Though sorely tempted, I never actually used their service because I lived in Soho, which was dead near restaurants and small grocers (and two steps away from Dean and Deluca, though I never did much shopping there) and because it was summer (ie. it wasn't so cold for a winter wimp like me to walk to the stores). In the years since I've left though, the service has gone from strength to strength and I frequently hear my friends mention it now, as quite a regular part of their lives. It stands to reason that as a society and city develops, door-to-door grocery delivery will become more popular especially among young couples who are short time. I myself quite like browsing in a supermarket, in fact, it gives me a great sense of joy and security to be amongst so much food (a fact that never fails to amuse less domesticated friends) but even so, it Is quite a luxury to have groceries delivered to you. You come home and the meat, the pasta and the sugar peas are waiting for you and to be cooked straight in the pan for dinner. Although perhaps a trivial luxury and I guess for those who can afford it, I did think it was quite a treat, sort of one step down from having a meal cooked for you. In any case, I hope you guys do go take a browse through Greencgrocer. It's quite comprehensive but there are in particular, three things to note. One, the site does not sell duck. I was looking for it because it's one of my favourite meats. Two, where the item is preceeded by an FZ, it means it is frozen. For some reason, I didn't quite pick up on this and wound up with a pack of frozen rather than fresh chanterelles. Three, for the meats, the thickness depicted in the pictures can be a little deceptive, the steaks are thinner sometimes than the pictures suggest. There is one other thing but I'll save it for later. Note also that the redemption and other functions are a bit hard to find, they are in smaller print, in green, on the left side of the screen before you hit the payment process. Particularly good deals (my thoughts only) were the baby lamb shanks, which were 5 for $20.70 (200g each), the smoked salmon $42 for 1-1.3kg. I was intrigued by the Cote De Beouf which was $46 for 800g, except that it was out of stock. I'd also like to order the 1kg piece of black cod for $41.90 the next time, except that I was wont to test their delivery of fresh fish and one can get it at the wet market on the day of eating. There are some items that are not very good deals, like the broths and herbs which can be obtained at competing gourmet stores for less. The delivery process takes two days and for me, the experience was perfect. I ordered it at 11.50pm on Tuesday, just as the website said and it was delivered Thursday morning. I'm not sure how well it will work if you live in a high-rise flat or apartment though, I suppose it depends on whether they can find their way or are let through it you have an apartment entrance barrier. I also received a printed receipt (right now you can use your credit card to pay, although Paypal sent me subsequent emails about using their service to pay). Delivery is free for orders of over $150 but when calculating your total, don't forget you need to add in the GST, ie. the listed price of the items is not calculated as the total and final price. While clicking out of the website, I discovered that the contact helpline was to Indoguna Singapore. How silly! Indoguna is where Colin and I have been getting our meats for ages, they are a wholesale importer located out in Woodlands and I guess Greengrocer is their retail operation. While they have their own abetoir, they are largely an agglomerator for other products and fine foods. This would explain why the meats I received were very fresh but the other items were largely frozen and the squid ink linguine that I ordered was still in its original bag, with had an Italian brand stamped all over it. Our last day in Jakarta was a blur after the eventful weekend. One place that I toured, which isn't exactly about food, though it does have a very romantic tiered top-deck restaurant, was the boutique hotel at Kemang. If you can deal with the traffic and the inconvenience of the Kemang location itself-the street is long and narrow, with a great number of eateries and shops but it should be pedestrain only, as it's so narrow the taxis are forced into a virtual stampede, belching exhaust all over the walking tourists and teenage locals, the Kemang Icon is a great place to stay. It has a prime location in Kemang, right on the one intersection and an understated, artistic decor. The first couple of floors of the building house very cool shops, amongst them, a bag store with some drool-worthy exotic skin handbags and a gorgeous shop called Part One by Edward Hutabarat, who makes modern dresses out of rare batiks from the Indonesian rural villages. The hotel is on the middle floors and I was wondering, doesn't that make them pretty noisy? There are rooms as well as suites and they start from about $300USD I believe. Some of the room decor is a bit expected but some of the other parts are still sleekly beautiful and dark. This room in particular, the suede headboard and the contrast with the luminous shape of the light and the smooth ceramic of the bathtub was just gorgeous. I was very impressed and if I had that kind of money to spend, I'd definitely come back to try a stay or maybe to get a drink at their roof-top restuarant. This is not a good photo because the lighting was just terrible but what you can appreciate is, they put up a glass barracade around tiered wooden steps where the tables are set up. The service is discreet (and almost invisible in their black-shirted uniforms) and the air is cool, scented by the potted mango trees and the lit city of Jakarta swarms far under your feet.